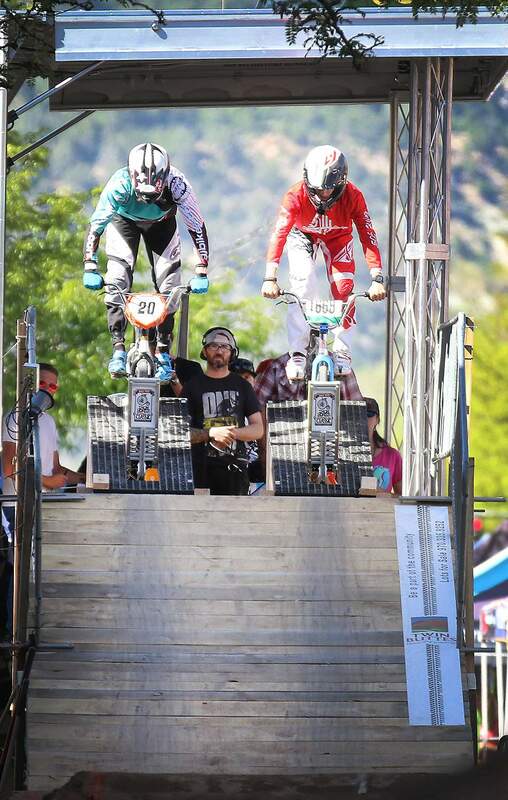 Collin Hudson, right, beat out Tomas Fernandez for the overall title during the Iron Horse Bicycle Classic BMX men’s finals last year. Both Hudson and Fernandez are back for the second running of the BMX event. Spectators lined the length of the BMX course, in some places several people deep, during last year’s events at the Iron Horse Bicycle Classic. After the success of 2017’s inaugural race, organizers believe the BMX event could become the biggest spectacle of the weekend. 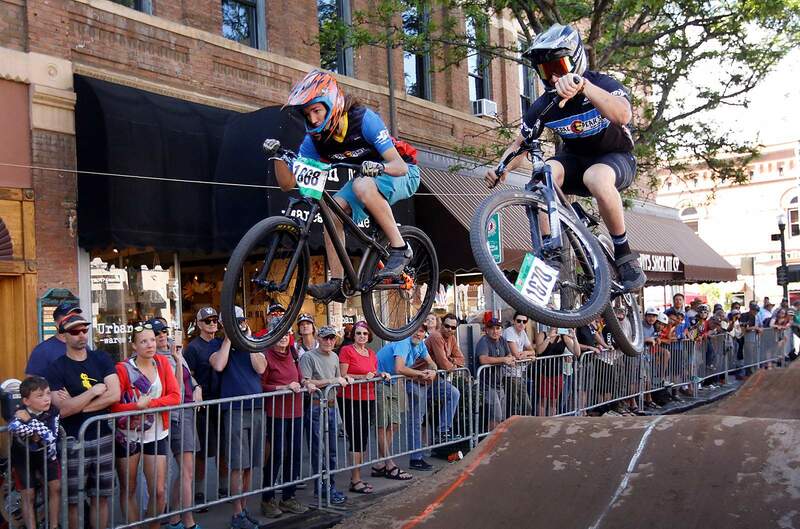 BMX is back in downtown Durango for the Iron Horse Bicycle Classic, and after a successful campaign during its first year in 2017, organizers believe this year’s version will be bigger and better in several ways. 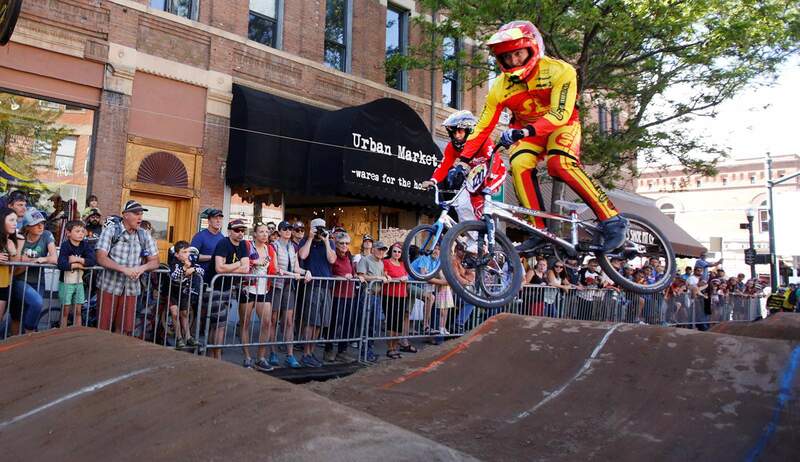 “It was a new idea last year, and the overall concept is to create a spectacle and have something fun to watch downtown without having to go everywhere,” said Durango BMX’s Jordan Rupe, who was a key member of bringing BMX to the IHBC. “That’s one thing that’s so appealing about an event like (BMX), everything happens right in front of you. One of the major changes coming to this year’s straight rhythm event is a change in the course. Last year’s course ran along Main Avenue, while this year’s will utilize the hill on East Ninth Street, cross Main Avenue and finish on west Ninth near the alley. The change will allow the course to add speed and bigger features. 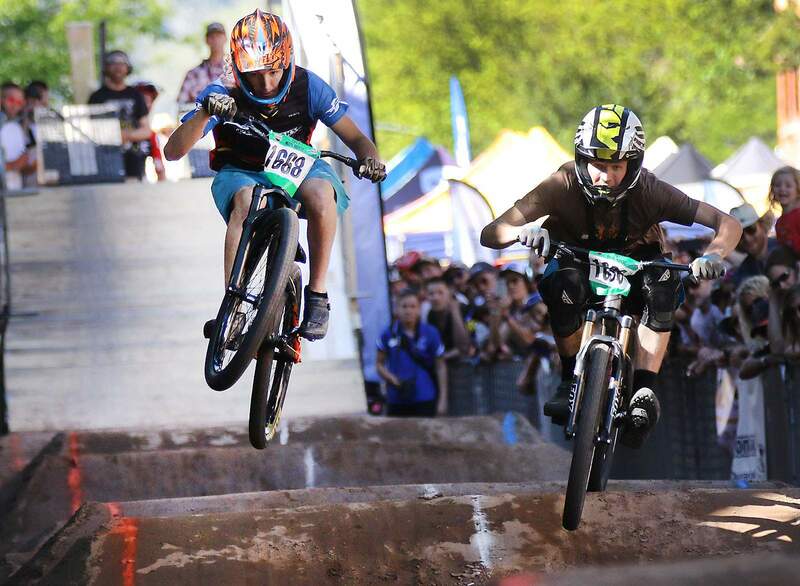 Benjamin Bennett, left, beats out Zach Graveson during last year’s Iron Horse Bicycle Classic BMX mountain bike finals. Both Bennett and Graveson are registered for this year’s event, which is expected to have more than 50 racers. Moving the course off of Main also allows more time for the builders of AJ Construction, which was hired to build the course again this year, to get everything set up in time for the start of the race at 1 p.m. Sunday. Last year, because the entire course was on Main Avenue, Grady James and his crew at AJ Construction had only the early Sunday morning hours after midnight to build the course. This time around, they’ll be able to build the bulk of the course during the day Saturday, saving the stretch across Main for the early morning hours Sunday. The right angles and trajectory are more important this time around because of the size of the features and the speed at which the racers will hit them. Whereas last year’s course design was limited by running on the flat Main Avenue, this year’s course will have bigger features – some of which will use wooden ramps covered by dirt – spread out more by using the hill on Ninth Street to give the riders more speed. Riders get ready to start during the 2017 Iron Horse Bicycle Classic BMX races on Main Avenue. The biggest feature will be in the middle of Main Avenue. In order for pedestrians and spectators to get from one side of the course on Main to the other without having to walk around the entire course, a large storage container will be placed on Main. The container will be opened on both ends to allow people to walk through while riders go over the top. “It should be, potentially, more spectacular than last year,” IHBC director Gaige Sippy said. “There’s an A and a B line to get over the container, but the A line, the ramp is serious hucking. 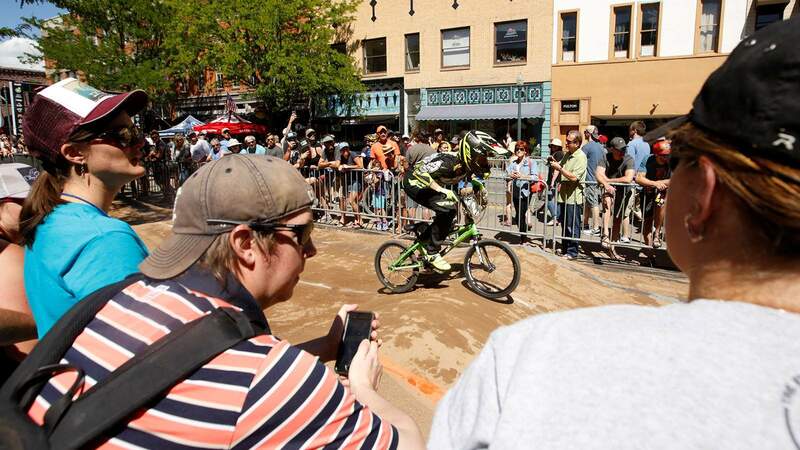 With the BMX course moving from Main Avenue to Ninth Street, racers will catch more air off larger features this year. Moving the course to Ninth Street also will allow more room and better vantage points for spectators, who lined last year’s course six or seven people deep. The 2017 invite-only field featured 32 racers, and this year Rupe expects more than 50. There are already several returnees from last year’s field, including overall champion Collin Hudson and runner-up Tomas Fernandez as well as mountain bike champion Ben Bennett and mountain bike runner-up Zach Graveson. The women’s field will be highlighted by Fort Lewis College alum Rebecca Sheppard, and Rupe said fans should keep an eye on Rachel Mydock, a pro out of Chandler, Arizona, who flies on her bike. The event will offer a unique competition for the racers, who go head-to-head with each other in a bracket format to determine the winner. 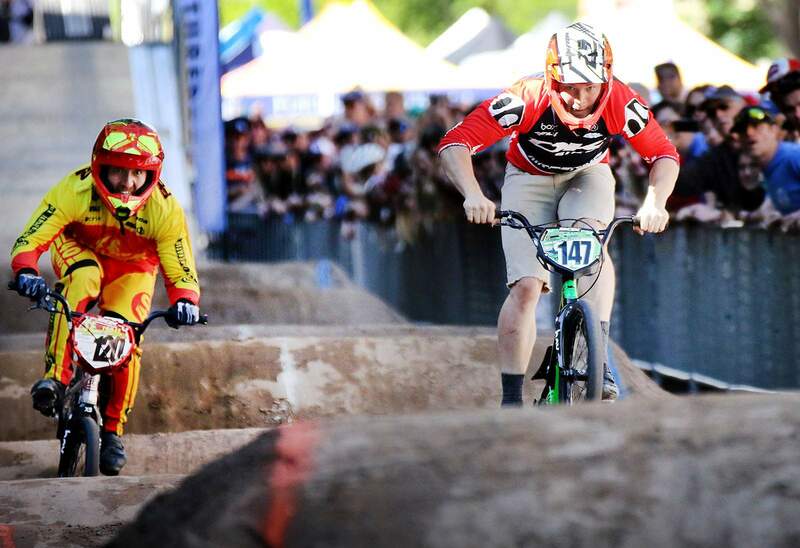 Tomas Fernandez placed second during last year’s inaugural BMX race and will be back in the field this year. Racers will begin with time trial runs to determine seeding for the bracket. In the bracket, racers are matched up head-to-head, with two runs in each grouping, one riding the A route and the other on the B route. They will then switch lines for the second run. The racer with the lowest combined time for the two runs will advance to the next round. There is a maximum-advantage of one second for the first run, which allows a racer who crashes on the first run a chance to still advance in the bracket with a good second run. Sippy expects this year’s BMX races will take over as the largest spectacle of the IHBC weekend. The mountain bike races run through Steamworks Brewing Co. will always garner a lot of attention, especially now that the route has been modified to make it easier for more riders to make the run through the bar. But based on the feedback and excitement BMX drew in 2017, the second time around should be even bigger.